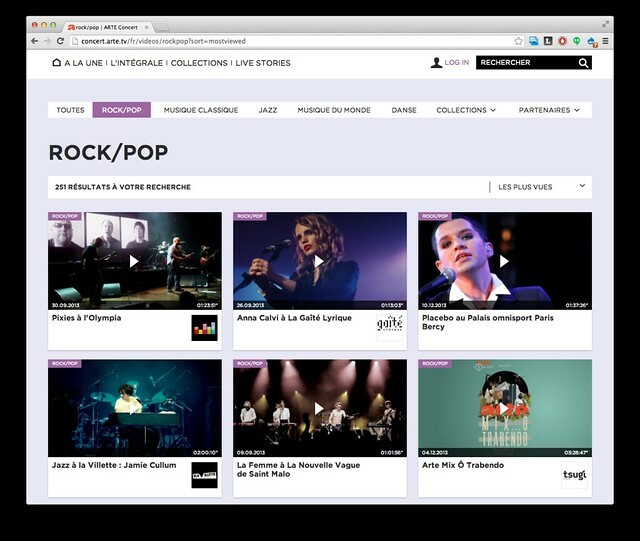 This week, Arte - the Franco-German TV network and "European cultural channel" - has launched ARTE Concert, a rebranding of the music platform Arte Live Web, on the popular Drupal platform. The relaunch marks a fresh start of the video streaming site, in which over 600 concerts are broadcasted yearly in High Definition - over half of them live. ARTE Concert homepage for the German audience. The website content is fully bilingual in German and French, and different content is highlighted for the different audiences on the homepage and other parts of the website. Live concerts are streamed via the website, and Arte produces an on-demand version of the concert in HD that can be viewed online and entirely free on the platform afterwards. Check out the rock concert of The Pixies, the jazz performance of Avishai Cohen or the Fado of Antonio Zambujo for some of our favorites! Video collection featuring a large selection of music and culture. Berlin-based consultancy agency Kreuzwerker assembled a team composed by Drupal freelancers Alex Wilde and Maarten Steurs, Philip Vergunst from Your Source and ourselves. Marzee Labs took the technical lead in the relaunch, architecting and implementing the Drupal 7 rebuild of the platform. Spearheading a team of five full-time developers, we improved our development and deployment processes using PHP build processes, a pure database-free deployment cycle, code reviews with Github's pull requests, and cloud deployments using Acquia's Cloud Hosting. Interested in our methodologies or technical write-up of the site? Keep an eye on our upcoming blog posts, and enjoy the vast selection of free concerts in HD on ARTE Concert!